Hey! Guess what? 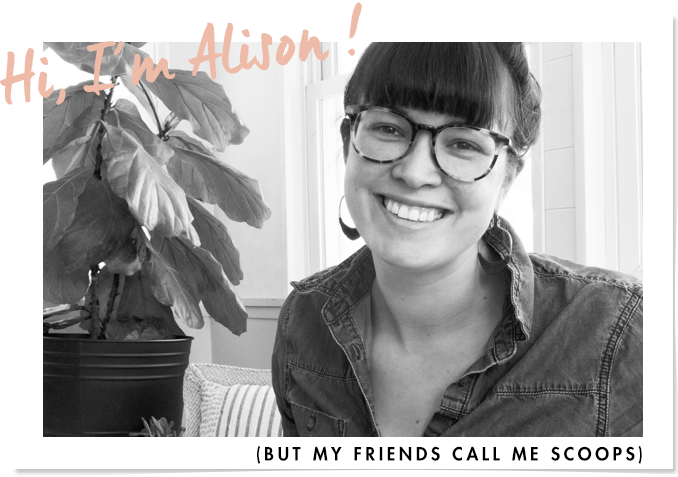 This is going to be my first official post of the year for Ace Hardware! 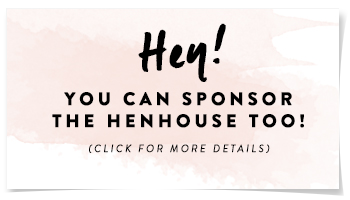 I’m sincerely so, so excited to be working with them – I just love my neighborhood Ace Hardware store, and I feel really fortunate to be teaming up in a brand that I truly adore and use all the time. I’m madly excited for spring, and I wanted to write a post to share with you guys on indoor seed sowing. 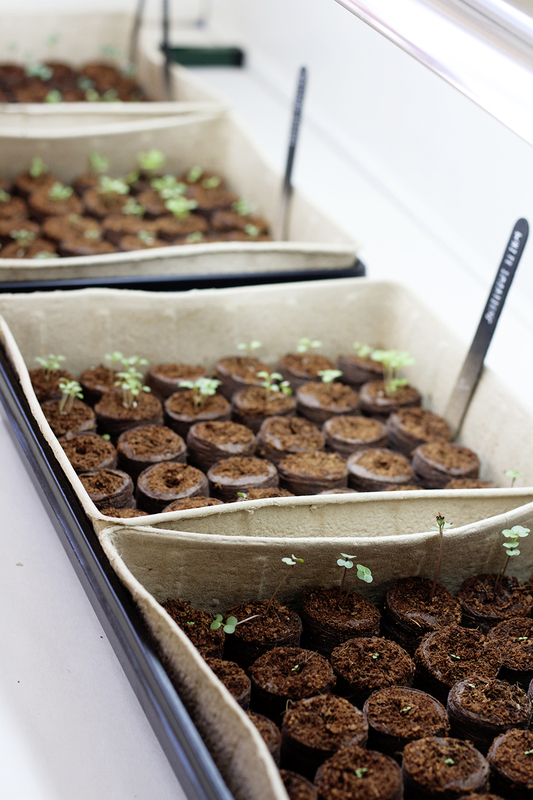 Sowing seeds indoors is one of my cures for the winter blues – there’s nothing like a little seed sowing to get you amped for spring. In case you’re new to this idea, “sowing” is planting seeds in soil with the hopes of having them germinate and sprout. Many seeds can successfully be sowed indoors before the ground thaws – with patience and daily maintenance your seeds will germinate, turn into plants, and grow! 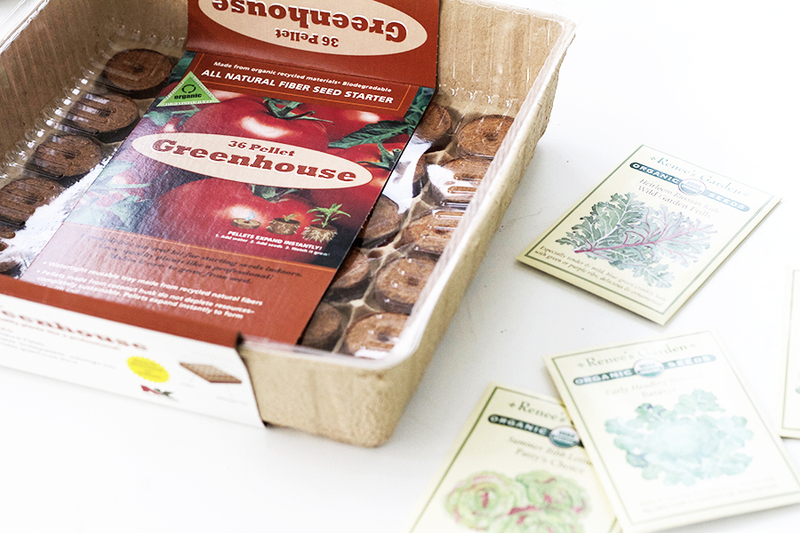 Before you know it you’ll be ready to plant them in your spring garden. Don’t have a veggie garden? That’s just fine, consider starting a flat of Impatiens or Petunias indoors and save yourself the cost of paying up for mature plants at the nursery. There are many options when it comes to materials to sow your seeds in. You’ll find items on the market that range from sterilized seed starting soil to sponges designed for growing seeds. My first few years sowing seeds I used a soil made specifically for seed starting, then last year I started seeds in coconut husks for the first time and was happily surprised at how easy they were to use, and I had more success germinating my seeds. I’m a coconut husk girl now. The coconut husk pellets expand and grow as soon as they are introduced to water, within a few short minutes they’ll be ready for seeds. Refer to the instructions on your seed packet for depth of planting. 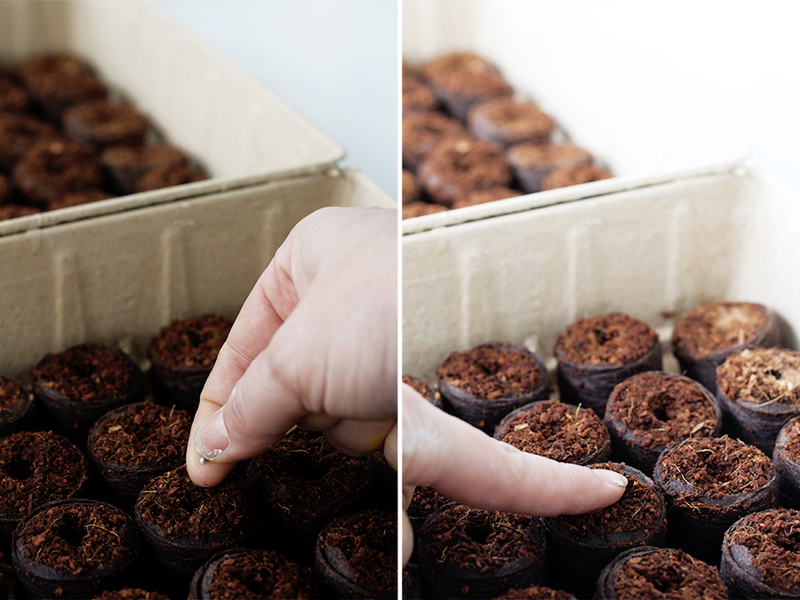 A good rule of thumb is to cover the seed with a fine layer of soil, usually only as thick as the seed. Germination is the stage in which the seed sprouts after you have planted it. 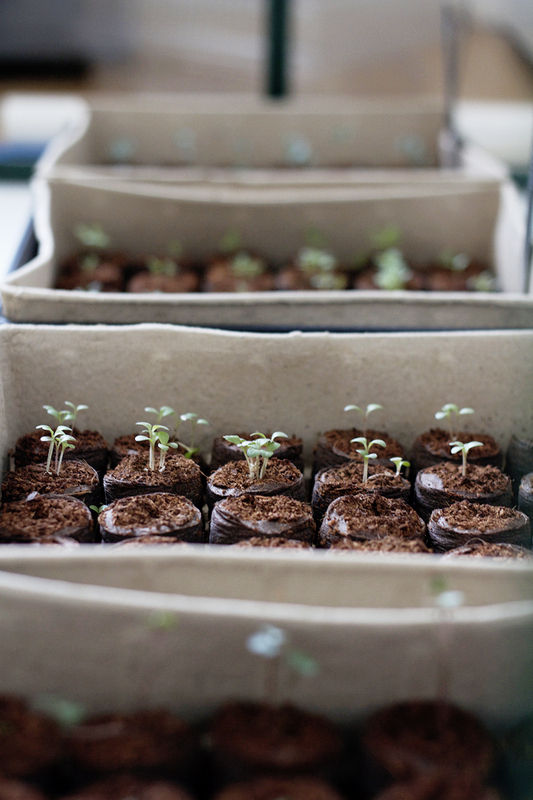 Light isn’t necessary during germination, you could even start flats of seeds in the basement if it was warm, it is imperative that provide a warm environment for them. There are seed mats available to guarantee a warm spot for your seeds, but it isn’t necessary. I put my germinating seeds in the warmest room in our house, and place them about a foot away from the radiator. Sow seed in a moist mix, or in this case husk. During the germinating phase cover the seeds with the plastic cover that comes with the seed starting kit to trap in humidity. Remove the plastic top once you notice the seeds beginning to sprout. 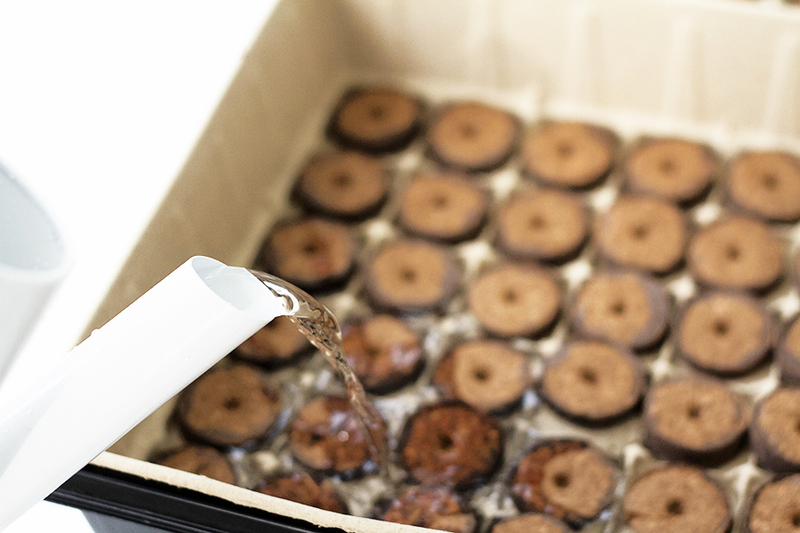 During the germination phase keep the seeds moist with a spray bottle, once the seeds begin to grow and sprout water the seedlings by pouring water directly into the bottom of the tray. 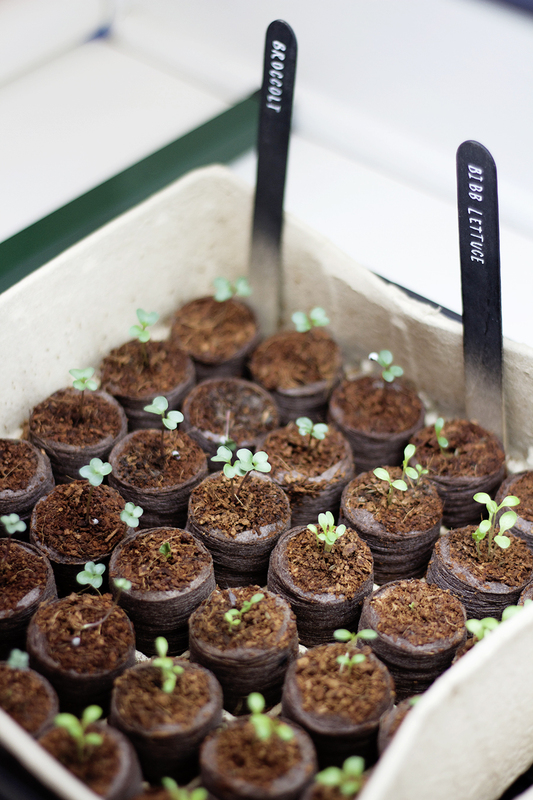 Once seeds germinate (usually 10-20 days) and sprouts appear they will need a lot of light. 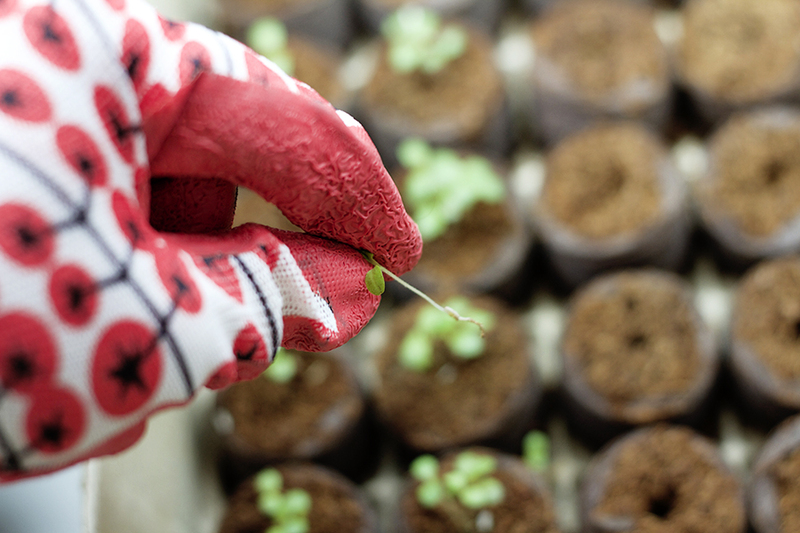 These young seedlings need 16-18 hours of light per day! Sun is hard to come by here in the upper-midwest, so I got serious about my seed sowing and invested in a 48″ grow light. 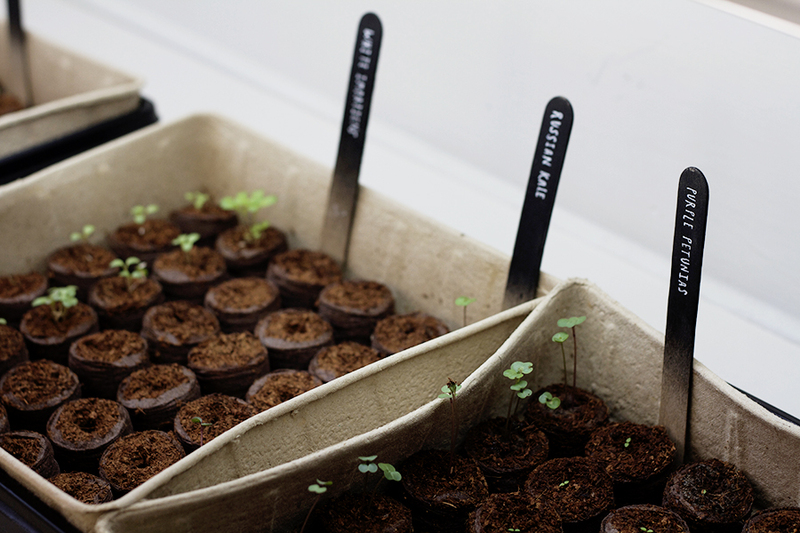 It made a huge difference, within days my seeds had germinated and are now growing fast and furiously. Remember, if you decide to use grow lights you’ll want the lights to hang 3 – 4″ over plants as they grow. 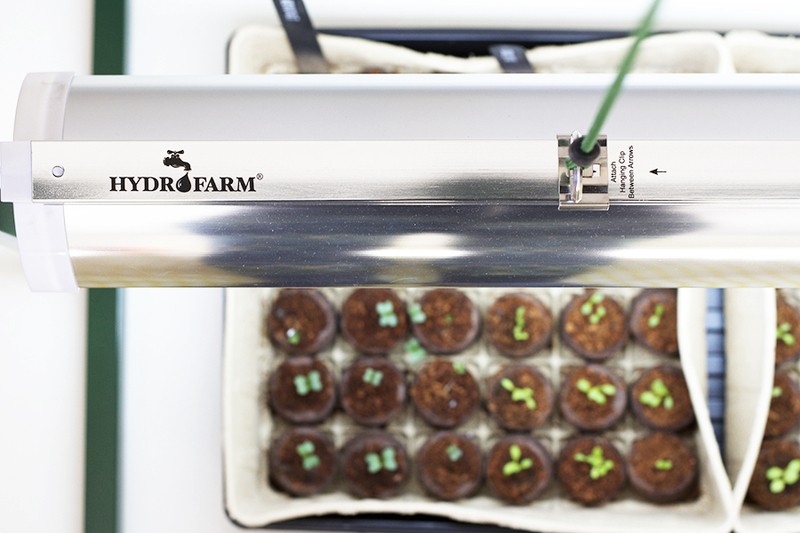 The Hyrdofarm system that I am using is easily adjustable to accommodate growing plants. 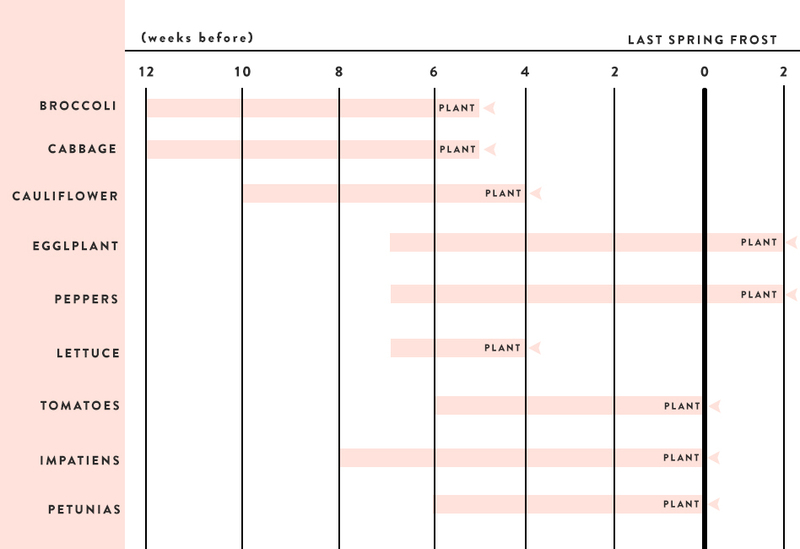 It’s important to schedule your seeds! You don’t want to have plants that are too big and outgrowing their containers, or too small and unable to survive transplanting. Below you’ll find a schedule that I like to use – for the Twin Cities area May 15th is generally a good rule of thumb for the last frost. Around the 6-8 mark, your seedlings will be outgrowing their husk homes. Now is a good time to move them to a larger container until it warms up enough to transplant them outdoors. In reality you can use any container as long as it’s sterile and has adequate drainage. Recycled food containers, newspaper and biodegradable pots are a few options for good planting containers. To sterilize, use a mixture of 1 part bleach 9 parts water. Once your seeds begin to have one to two leave sets, you’ll want to thin them out if you have multiple seedlings growing in one husk. Most will be 2-3″ tall by then and easy to grasp. Make sure to water your seedlings before thinning them as they will be much easier to remove in damp soil. If you’d like to keep excess seedlings place them in their own individual husks, do this in the evening as it will give the plants a chance to adjust to their new environment before being exposed to light. When it comes time to move your plants outdoors you’ll have to get them ready. This is called hardening off. To do this, bring them outdoors for a few hours daily, increase the amount of time they are exposed to the outdoors over the course of a week. Then go ahead and plant them in the ground. My pals over at Ace Hardware want you to get your green thumb on too. I’ll be giving away a $100 Ace Hardware gift card to one of you lucky people. Giveaway runs through Friday, February 27th at midnight, the winner will be announced within this post. This giveaway has ended, Congrats to Renae! We have been cleaning like crazy and getting the garden ready. I swear I’m not stalking you, but I do stalk my local Ace Hardware paint guy, Dave. Every time I go in there he says “what are we getting ourselves into this weekend?”. As for getting ready for spring (!) around the house, I’m a beekeeper, and the end (?) of winter is when it’s time to repair broken hive parts and get ready for Spring bees. We’re in Virginia and we’ve already lost one hive over this (very long and unseasonably cold for us) winter and are hoping that the other has made it through the last week of negative temps. If all goes according to plan we’ll be ready to install our new hive at the end of March. I’ve never felt more ready for a change in the seasons. We’ve still got another 4-6 weeks of winter to get through here in northern Vermont, but I am currently scheming and planning for our very first garden this year. 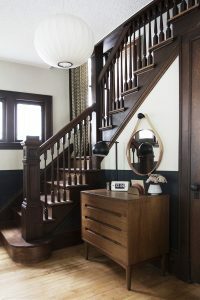 Oh and day dreaming about having some space in my entryway when we can finally ditch the coats and boot and boot tray and scarves and hats and glove and….. I LOVE starting seeds indoors, but I recently moved, and have been more worried about the house. I’ve been deciding which flowers to plant in the spring though! Indoor plants! It’s amazing how some greenery can brighten a room. I bought a boring but luscious pothos plant recently and someone just commented how nice it looks on my mantle. I’m hoping the tabletop tulip garden I bought can survive this cold snap; at least the sun is shining today! Those coconut husks are seriously cool. I’ve never seen those before! I’m getting ready for spring by getting our foundation inspected. Not fun, but necessary before we do anything in the yard. Living in East Central Minnesota, we have a very large deer population. The deer think my garden is the local buffet for them and their friends. 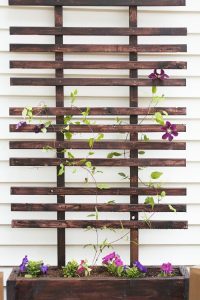 So, I’m planning a design for a fence to keep them out but one that also looks nice. Thank you for the little shot of spring today. Have a beautiful week. I just threw a spring themed party for my 3yr old’s b-day. It was perfect on a cloudy winter day! Looking forward to painting some interior walls as soon as I can throw open the windows! Speaking of windows I am looking forward to cleaning them as well. I’m due mid-April with our second boy, so we’ve been getting the nursery ready! That’s about all I want to take on. Now, to try and get my three year old to give up his crib…that’s a whole other subject. Does cleaning snow and ice out of the gutters to prevent water from leaking into our walls and windows count? I’m excited to re-pot some houseplants and start propagating new little indoor plantlets in a few weeks. Susannah- my Ace hardware guy is Charlie! And to answer the question, Charlie helped me find fittings that will allow me to hook up hoses to the tanks I am putting in for rainwater collection. Planning to catch some spring rains to grow my garden. Beautiful pics, btw! I’m due in 3 weeks with our first so I have been walking around the house making a big list of things for my husband to do once the weather warms up, including but not limited to: fixing some gutters, insulating a mail slot, and planning a garden! As spring approaches we have quite a bit going on and a $100 Ace giftcard would help a lot and go a long way. We are expecting our first child in a month, so we are putting the finishing touches on the nursery. We are also gearing up for our garden in our new house by planting seeds and beginning to build a fence to keep the bunnies out of our veggies. I’m was planning our front flower gardens on either side of the front stoop…until we found mold in our bathroom. So now our spring planning is all indoors: new pipes! new tile! new tub! hopefully no other surprises! I have a great garden space in our new house. I didn’t know about the hardening part. This is my spring project. Grow a garden. I’ve been cleaning and decluttering like a mad woman. I’m hoping to go house hunting this spring and I want to lighten up before I move. If I do move, there will me many opportunities to shop at Ace, I am sure. I’m working on my garden plan and getting my seeds started. Thanks for this awesome giveaway! 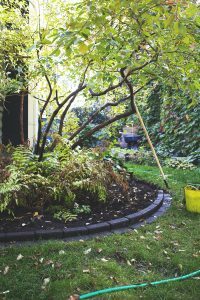 It’s time to tidy up the garden and the house. Putting up new pictures around the house, cleaning out the garden, and getting ready to plant spring tomatoes and peppers. To get ready for spring I cleaned my whole house, washed all my quilts, and started planning my garden! My backyard is 2/3 concrete slab and 1/3 moss and cat poop (from the neighbor’s cat, my cat only wishes he could poop outside) On the concrete patch (or what we call “the exercise yard” cause it looks like a prison) there is a 6×6 pile of roofing debris and a ceiling fan. In my defense the mess is the result of my cleaning up and fixing the house up after buying it from the former felon owner (he had been running a chop shop in the backyard) So pick me, pick me! I’ve become a pretty familiar face at my Ace and that Benjamin would go a long way towards my neighbors not hating me. 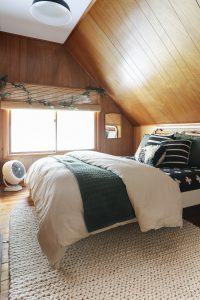 I’m trying to take care of the last of my indoor projects before spring comes and I want to spend every moment outdoors – deep cleaning/reorganizing the kitchen, redecorating the guest room, and I just finished up a major bedroom makeover!! It’s definitely spring-like in Oregon right now! I gave the lawn its first mow in months and have BIG plans for an herb garden. Your post is inspiring me to get some seeds started! Just cleaned out the closets donating about 30 items of clothing! Would love $100 to ACE to keep the spring refresh going! Can I be honest! Nothing. We have 10 fleets of snow here! Trying ton positive and survive. My community garden plot is my favorite place when spring gets here. We’re getting 5-7″ of snow this afternoon in Iowa, so spring feels really far away. You’re inspiring me to maybe get some flowers going this weekend, though; I’d love to have some impatiens to plant in the spring! i am cleaning a lot; getting the window screens changed on a few windows, i hate bugs getting thru them; powder washing the driveway. We have a very long list of tasks to complete by summer – first stage is getting rid of some inside clutter, then planning a flower garden, and hopefully this will also be the year we finally build a sandbox for the kids! I just started a bunch of seeds too, I bought the larger peat pots and seed starting mix because I get lazy about transplanting seedlings to larger containers once the roots start breaking through. So far I’ve got Rudebeckia, Heiriloom Alpine strawberry (red and white variety), Ground Cherry and the elusive Romanesco Brocco-flower. I’ve been able to get the Broco-flower to germinate and transplant but never have luck with it setting fruit. Fingers crossed for this year! Awesome post, Scoops! I’ve been dying for some greenz so I recently filled up all of my old pots with succulents and any other kind of beauties I can find! Well as I am in a new to us house, that hadn’t been taken care of for a decade – I am hand pulling a small killer grass that my dog ate last year which led to surgery to remove the grass seed. We don’t have that kind of grass in Michigan or Oregon so I had never seen it before. Welcome to California! I am also working on hand-weeding a small weed that puts out terrible burrs that get dragged into the house and stuck in the carpet. This small plant can’t hide from me because it has a yellow flower (I dislike yellow flowers) so I can head right to it to yank it out. I’m doing some major cleaning around the house, getting rid off things we not longer need/want, organizing what we do need and hopefully sometime soon I can give my master bedroom a little makeover. well… we have an RV now! There’s honestly so much I want to do now that its getting warmer though. Paint is at the top of the list for sure although I’m dreading it. Not sure what to do with these horrible wallpapered walls. Ack! I’ve got seeds ordered and garden plans sketched out! Would love to get those seeds started. It’s been a warm winter here in seattle. My tulips started coming up in January! We’ve been cutting back our bushes and trees and start out general yard clean up soon. Hoping to get done veggies going again this year too! Our spring project is to get the nursery in order. We need to fix some plaster cracks and paint our extra room to get it ready for our June visitor! Good luck with the seedlings. I’ve been cleaning and organizing our entire house. In a couple weeks I’ll be picking our loquat tree and making jam! im so ready for spring. We are planning out our annual vegetable garden, and I’m deciding on a few new perennials to add to a flower bed out front. And counting down the days til it’s above freezing out! We’re doing this exact same thing to get ready for Spring. My husband has quite the set up complete with grow lights! I’ve been cleaning, organizing the house, and gathering up supplies to start an herb garden for spring! It’s already felt like spring here in Utah for the last month or so — it’s been eerily warm and bright this “winter”. We did finally get about an inch of snow yesterday, and for the first time since Christmas it didn’t all melt by the afternoon. Alas, my spring preparations are not the fun kind — I’m gearing up to hand in and defend my Master’s thesis, so that’s what I’m spending my time on these days. Just today, I bought a few new indoor plants to help brighten things up these last few weeks of winter. Hoping that getting my hands in some dirt now will help me feel like spring is actually on its way! I’m getting ready for Spring by making a list of all the things I’m going to spray paint as soon as it’s warm enough to spray paint outside!! I’m planning to change the color of some of my furniture by restaining and painting! Great post! I may need one of those grow lights. I am a lazy seed starter. I just pour potting mix into those containers that salad comes in. I did a bunch of flower and herb seeds this past weekend but my father tells me it is too soon (we’re in Mpls too – in Linden Hills). I should keep up a chart like the one you did, but nah – too lazy! That’s a good idea to use those salad containers. I might steal that from you and do that when my seedling start to get a little bit bigger. Regarding your dad, I totally get following the rules BUT I could tell it was going to warm up early this year, so its probably likely that we’ll be able to get things in the ground a tad sooner AND I don’t see any harm in having larger plants ready to go into the garden. But, everyone does it differently, I get it. Enjoy the weather this week!! Oh how I hope you’re right about it being a true early spring this year! Last year was soo depressing. A non-snowy April would be fantastic! Older Post Let’s Think Green!